Ferries offer a relaxing and civilised way to cross the Channel and, with some astute booking, fare deals that rival budget airlines. Although recent years have seen ferry fares dip - in part due to the competition from budget airlines - ferrying back and forth across the English Channel can on first glance still seem relatively expensive. But if you are flexible on crossing times and dates, book in advance and are prepared to shop around, then there are a wealth of attractive fares to be snapped up that give budget airways a run for their money. Before factoring in cost, ferry travel boasts many advantages over flying. Firstly, unless you are cursed with particularly unstable sea legs, flights cannot hope to compete with ferry travel in terms of pleasurable travel experiences. Helping you unwind, a journey on-board can be a natural lead in to holiday relaxation rather than a stressful and unwelcome adjunct. Unlike an aircraft cabin, a ferry offers freedom, fresh air, space, entertainment and the privacy of a personal cabin. Budget flights may also offer shopping and food and drink but, unlike ferries, at a premium and with minimal choice. In terms of practical advantages, ferry travellers can take their own vehicle, and as a result can take as much luggage and as many souvenirs as you can carry – so there are no concerns about being fined for one bag being too big or too heavy. What’s more you can even take your pet. Ferries can also offer a more seamless connection with your destination – unlike many airports used by budget airlines ports are usually more convenient to the cities they serve. If the port isn’t your final destination then you can travel onwards with your accompanying vehicle or with the train, such as by opting for a sail-rail package or researching your own rail connections with websites like seat61.com. You may think that what they lack in perks, airlines make up for cheapness but even then, when you start to factor in hidden transit charges, car-parking costs, transport to and from the respective airports, so-called ‘cheap flights’ are often not what they first appear. 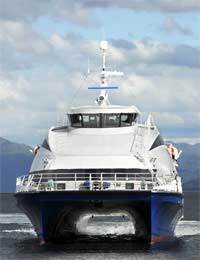 Ferry costs are generally more upfront and what’s more there are still great cost-savings to be had. First and foremost, the key to price saving on any route is to book early, particularly for peak summer season crossings. Like with budget airlines, ferry fares are often lower when ships are lightly booked and rise as they fill up, and so the earlier you book the cheaper the fare. Flexibility also pays dividends. The more adaptable you are with regards to the time and dates of your crossings the better the range of cheaper options. The cheapest crossings are generally midweek and at the least appealing times of the day. It’s also worth considering overnight journeys for longer crossings because a night at sea can save on accommodation costs at the other end, particularly if you are hardy enough to opt for a reclining seat over a cabin! Before booking any journey it is strongly recommended that you first review all of the available options on and around your intended route. Websites such as ferrybooker.com, directferries.co.uk and aferry.co.uk are useful in providing a summary of all the different pricing options for the various routes and ferry operators. This is especially important on the longer cross-channel routes where ferry competition is lighter and as such, bargains harder to come by. Even if you are set on a particular route where only one ferry company operates, these overview websites can help you ascertain whether the ferry company has given you the full range of times and fares available. Once you have pinpointed your ideal crossing it is then advisable to book online through the operator’s own website. If you book through their telephone reservation service or through an independent booking agent then you will likely be subject to mark-up fees. In addition to the various techniques in securing the best deal, there are also various offers available. For the shorter routes in particular, vouchers can often been found in newspapers or on money saving websites. If you are a frequent ferry user then ‘ferry travel clubs’ offer discounted fares in exchange for a typically small annual membership fee. Overseas residents can take advantage of frequent user discount schemes like Brittany Ferries ‘Property Owners Travel Club’. Finally, although ferries are a great way to travel and provide numerous opportunities for money saving deals, it is still worth checking out the alternatives such as the Eurotunnel, Seacats or the hovercraft because they can sometimes match ferries on price and are faster.